Explore the roles of common psychotropic agents and their role in therapy across mood disorders. Describe key parameters for medications used to treat the manic and depressive episodes of bipolar disorder including mechanism, safety, tolerability, efficacy, cost and simplicity of use. Apply pharmacologic knowledge of common psychotropic agents to formulate drug therapy plans within patient cases scenarios. Relate physiologic and pathophysiologic alternations of brain neurochemistry to symptoms of depression of psychosis, including the genetic link and molecular basis of injury leading to maladjustment behaviors. Explore the barriers to diagnosis of Addiction Illness/Substance Use Disorder. Categorize the changes in diagnostic criteria for AI/SUD. Describe the main considerations for clinical management, stages-of-change, assessment, motivational interviewing and brief office interventions for AI/SUD. Demonstrate knowledge of substance use, misuse, dependence, addiction including psychodynamic aspects, spiritual aspects and dual diagnosis. Apply current evidenced-based approaches to select diagnosis and appropriate treatment regimens for common upper and lower respiratory infections. Describe novel laboratory and diagnostic tools for rapid identification of common respiratory infectious diseases. Choose appropriate pharmacologic regimens for the treatment of respiratory infection in specific patient populations, including attention to local data and national guidelines. Apply practical tools to identify and treat common infections encountered in clinical practice. Describe the prevalence of obesity and diabetes in the US population. Analyze the challenges of influencing weight loss and obesity in clinical practice. Implement a systematic and practical approach to the management of weight loss and weight management. Describe comprehensive medication assessment tools and techniques that support management of inappropriate polypharmacy. Apply practical tools to screen and appropriately manage complex drug regimens among older adults with or at-risk for drug injury. Professor and Chair, Department of Physician Assistant Studies, School of Medicine, Wake Forest University, Winston Salem, North Carolina. Disclosure: Dr. Bushardt has NO financial arrangements with any corporate organization that might have an interest in the subject being presented. Disclosure: Ms. Curtis has NO financial arrangements with any corporate organization that might have an interest in the subject being presented. This Live activity, PRIMARY CARE UPDATE - MEDITERRANEAN CRUISE, with a beginning date of 06/25/2016, has been reviewed and is acceptable for up to 10.00 Prescribed credit(s) by the American Academy of Family Physicians. Physicians should claim only the credit commensurate with the extent of their participation in the activity. AMA/AAFP Equivalency: AAFP Prescribed credit is accepted by the American Medical Association as equivalent to AMA PRA Category 1 Credit� toward the AMA Physician's Recognition Award. When applying for the AMA PRA, Prescribed credit earned must be reported as Prescribed, not as Category 1. Doctors of Osteopathy: American Osteopathic Association (AOA): CME activities approved for AAFP credit are recognized by the AOA as equivalent to AOA Category 2 credit. PHYSICIAN ASSISTANTS: American Academy of Physician Assistants (AAPA) accepts certificates of participation for educational activities certified for Prescribed credit from AAFP. Physician assistants may report the number of hours stated above of Category I credit for completing this program. University Learning Systems is accredited by the Accreditation Council for Pharmacy Education as a provider of continuing pharmacy education. All programs are accredited for pharmacists, selected programs also carry the "T" designation and are approved for technicians. Nurse Practitioners/ Nurses: American Nurses Credentialing Center (ANCC) and National Certification Corporation (NCC) accept ACPE and AAFP credit. University Learning Systems courses fulfill the pharmacology requirements for ANCC Category 1 Continuing Education Hours for certification renewal. The same hours submitted to renew certification may be submitted to a State Board of Nursing for re-licensure. Nurses : University Learning Systems is Approved by the California Board of Registered Nursing, Provider Number CEP 11409. University Learning Systems (ULS), is accredited by the Accreditation Council for Pharmacy Education (ACPE) as a Provider of continuing pharmacy education. Canadian Council on Continuing Education in Pharmacy (CCCEP) accepts courses accreditedby the Accreditation Council for Pharmacy Education (ACPE). University Learning Systems is NAADAC Approved Education Provider number 882. All contact hours or CEUs provided will be accepted towards National credentialing by the NAADAC Certification Commission and state licensing or certification bodies that accept NAADAC credit. Please contact your respective board regarding approval. Contact University Learning Systems if you need help or documentation. Barcelona&apos;s food is also a highlight: stop into a tapas bar and try a variety of delicacies. "Standard" restaurants of every style are available, too. And, there's music, too! Visit an underground jazz club or the magnificent Palau de la Música Catalana; or stop by the Palau Dalmases for a stunning, flamenco performance (it's near the Picasso museum). Did we mention art? One of the largest collections of Picasso's art is found at the Museau Picasso, and a great collection of contemporary, figurative (i.e not abstract) painting and sculpture is housed at the European Museum of Modern Art just around the corner. 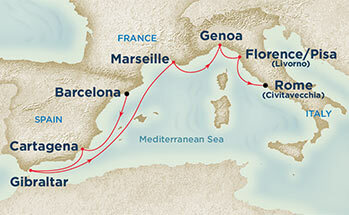 Civitavecchia (Rome), Italy (Debark) - Ah, the Eternal City: Romance, culture, food, history, art and fashion. You'll have to plan your time carefully as the sights of Rome are captivating and seemingly endless: the Colosseum and Forum, the Pantheon and Trevi Fountain and, of course the Vatican and the Sistine Chapel. And, of course, there are world class museums for lovers of every art era and fine food is easily found (take a brief stroll away from the most heavy tourist areas to find the good stuff). No, you really can't fit it all in one day (or even a week, to be honest) so plan a couple days enjoying the many pleasures Rome has to offer before returning home from your cruise conference. 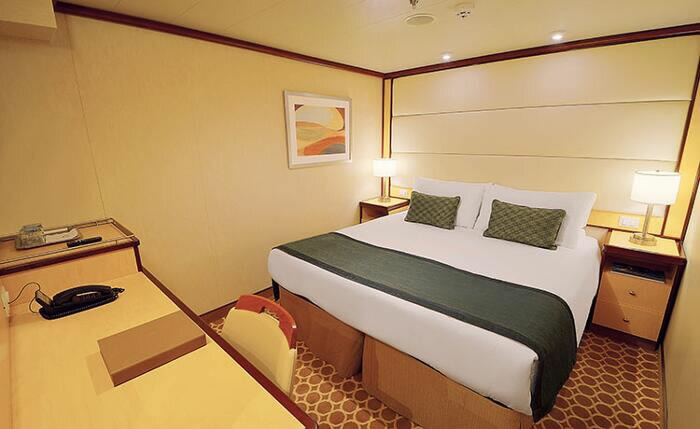 (S2) - Your Suite stateroom includes a spacious cabin and a large balcony, along with special suite-only benefits. Suites feature a separate seating area with a sofabed, walk-in closet, full bathroom and deluxe amenities.Separate seating area with a sofa bed. Upgraded balcony furniture with room for four: two comfortable loungers, a table and two chairs, Complimentary mini-bar set-up, Walk-in closet with personal safe, Comfortable luxury pillow-top mattress, Twin beds that convert to a queen size bed, 100% Egyptian cotton linens, Upgraded bathroom amenities and hair dryer, Two 42" flat-panel satellite TVs Evening bed turn-down, chocolates on your pillow, Refrigerator Writing desk and phone, 110V, 60-cycle alternating current (AC) with standard U.S. plug fittings, Hot tub in select suites, A host of other benefits and amenities. (MC) - The luxurious Mini-Suite offers approximately 299 square feet of comfort and an additional, separate seating area with a sofa bed for lounging or sleeping a third passenger. The spacious balcony is approximately 41 square feet and the bathroom offers a combination tub and shower. Amenities: Welcome glass of champagne, Separate seating area with a sofabed, Twin beds that convert to a queen size bed, Private bathroom with combination tub and shower, Shampoo, conditioner, body lotion, 100% Egyptian cotton linen, Balcony with patio furniture, Two flat-panel televsions, Satellite TV, refrigerator, hair dryer, safe, closet, phone and desk, 110V, 60-cycle alternating current (AC) with standard U.S. plug fittings, Daily housekeeping service, Evening bed turn-down, chocolates on your pillow . 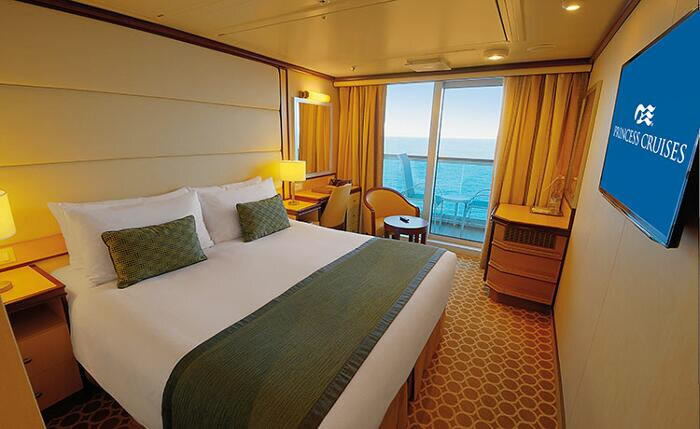 DD - Oceanview Double With Balcony - This impressive stateroom offers the elegance of a balcony with patio furniture. It offers all the amenities of a standard oceanview stateroom, including a spacious closet and desk. Approximately 214 square feet, including balcony. 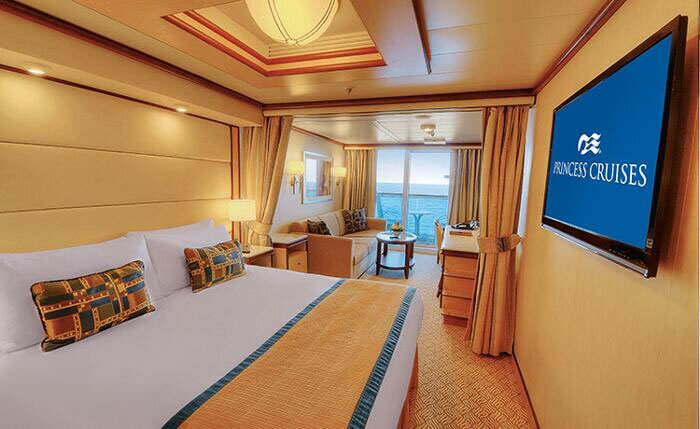 BC Oceanview Double With Balcony - This impressive stateroom offers the elegance of a balcony with patio furniture. It offers all the amenities of a standard oceanview stateroom, including a spacious closet and desk. Approximately 222 square feet, including balcony. 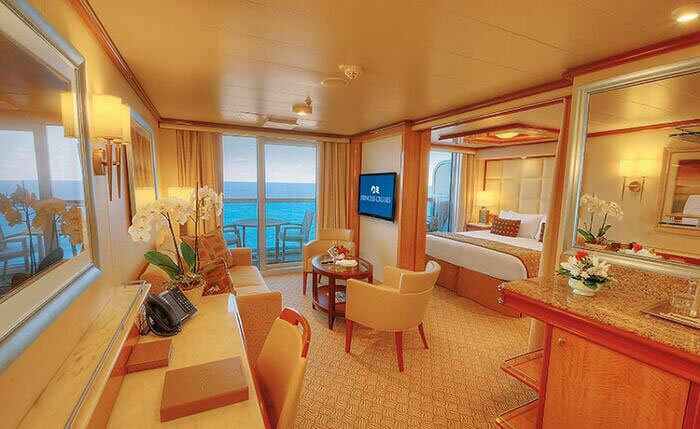 BW - Balcony (obstructed)- This impressive stateroom offers the elegance of a balcony with patio furniture. It offers all the amenities of a standard oceanview stateroom, including a spacious closet and desk. Approximately 222 square feet, including balcony. IB - Interior This stateroom features two twin beds that make up into a queen-sized bed. Other amenities include a refrigerator, television, closet and bathroom with shower.